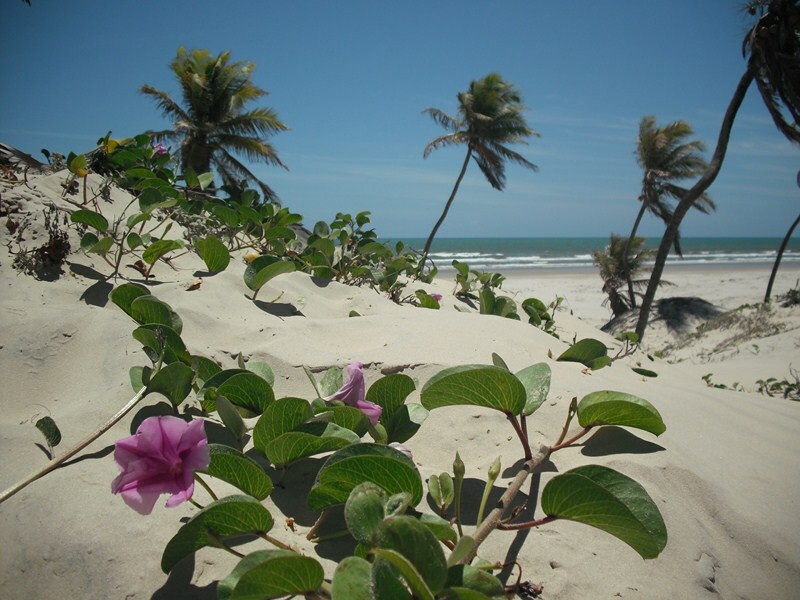 Brazilian coast, without doubts, is one of the most beautiful coasts in the world. 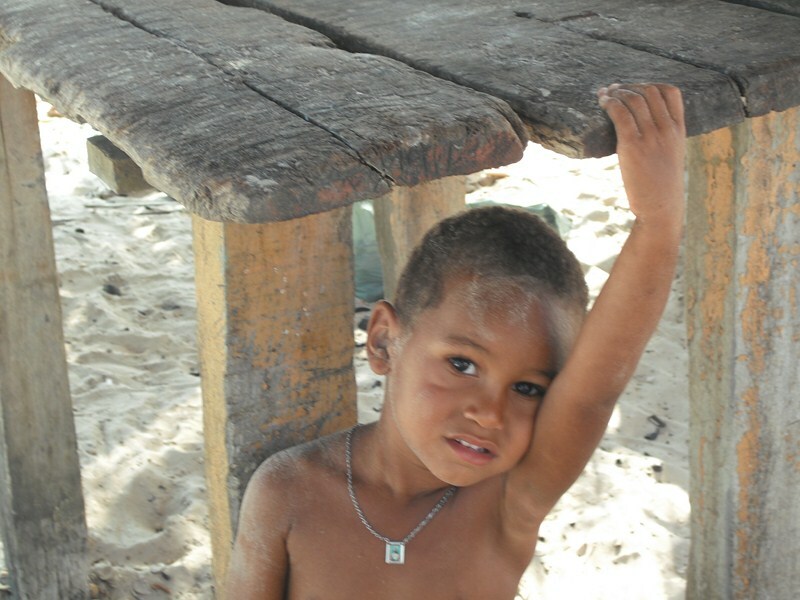 Last weekend we went to Mangue Seco – tiny beach village with only 300 inhabitants. Idyllic piece of Earth, covered with white sandy dunes, is separated from “other world” by two rivers. 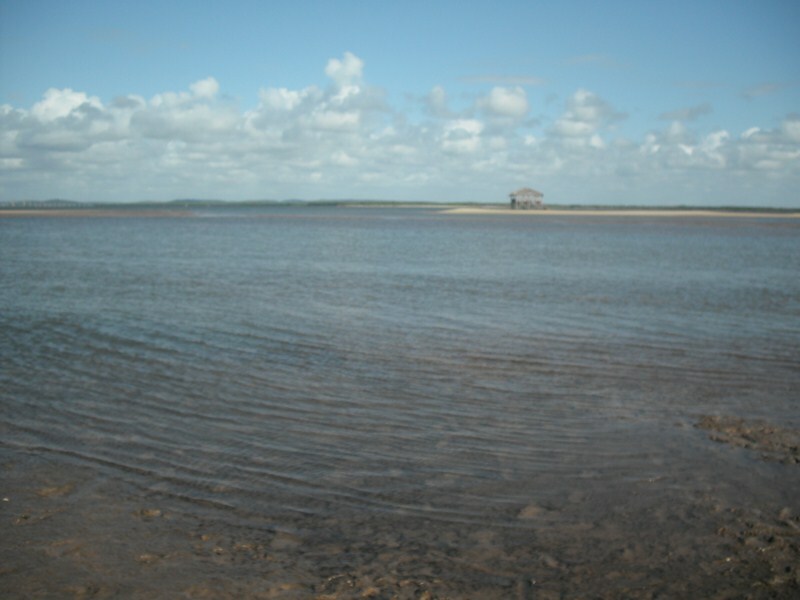 One of them – Rio Real (Real river) – creates the natural border of two Brazilian states – Sergipe and Bahia. 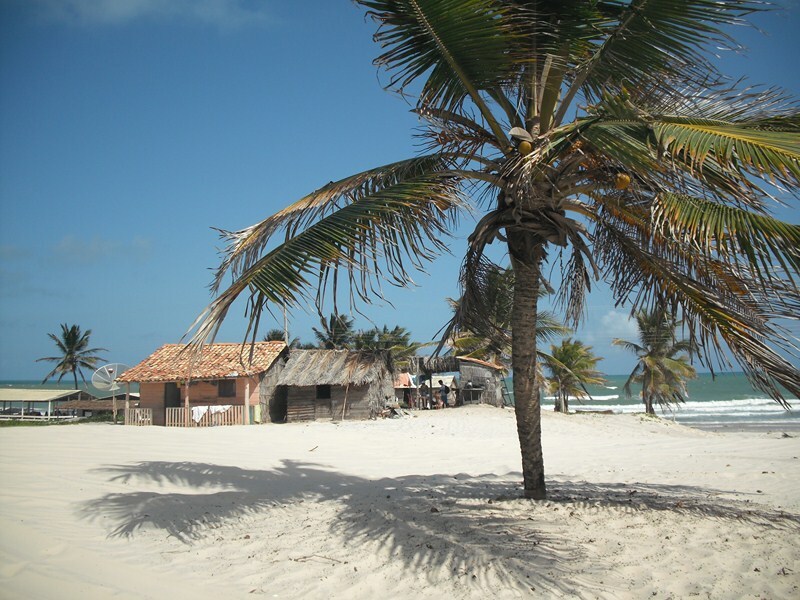 Despite its distant location and small size, Mangue Seco is well-known all over Brazil. Here the soap-opera – adaptation of the novel “Tieta do Agreste”, by the Brazilian writer Jorge Amado, was shot in 1996. 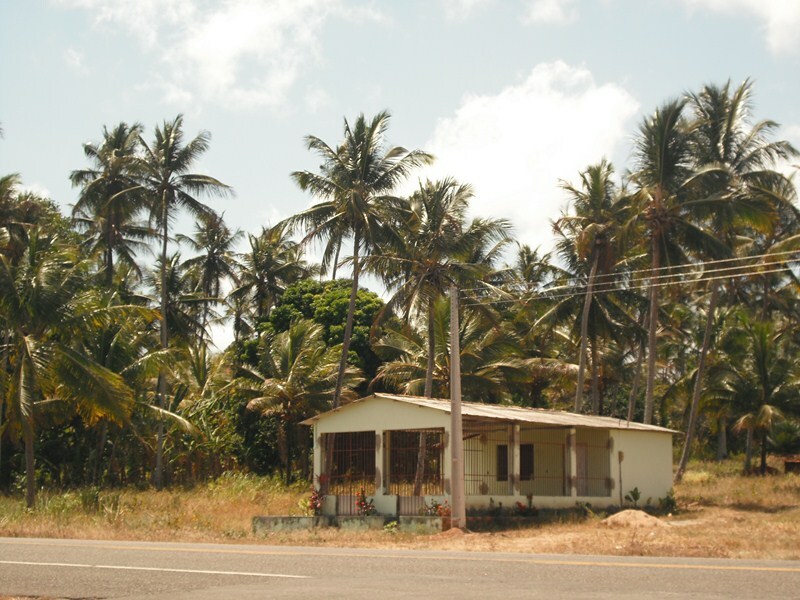 We spent four hours, driving from Salvador to the border of Sergipe. But this long way is definitely not a waste of time. From Salvador to the small town of Praia do Forte (I wrote about it here) runs Estrada do Coco (BA-099), or Cockonut Road. 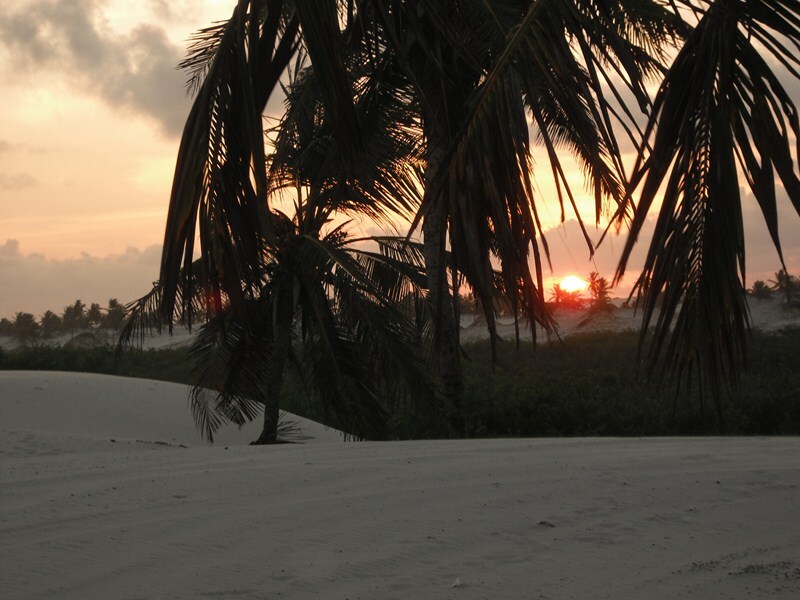 It deserves its name – there’re so many palms, surrounding the road that we hardly could see the coast of Atlantic ocean. After Praia do Forte the famous road Linha Verde (Green line) starts. 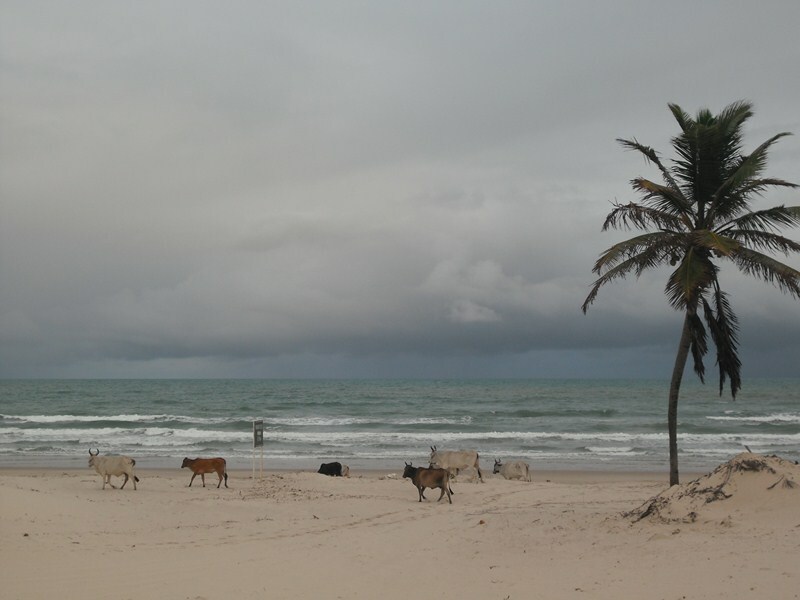 It goes north through the state of Bahia till the border with Sergipe. And was improved much for the last 10 years, my friend told me. We passed several “views” – “miradors”, which Linha Verde is famous for. On one of them we found sacrifices of candomble followers. 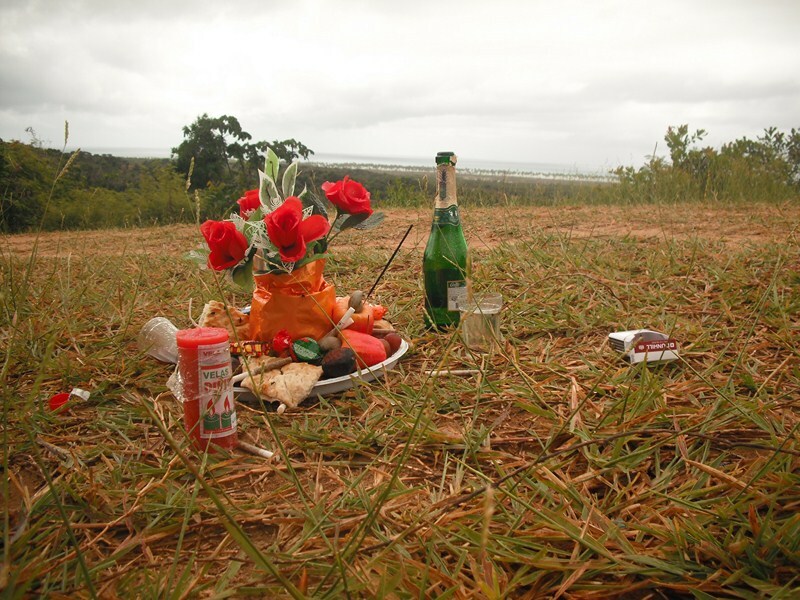 Candomble is a religion, mixed with black magic. 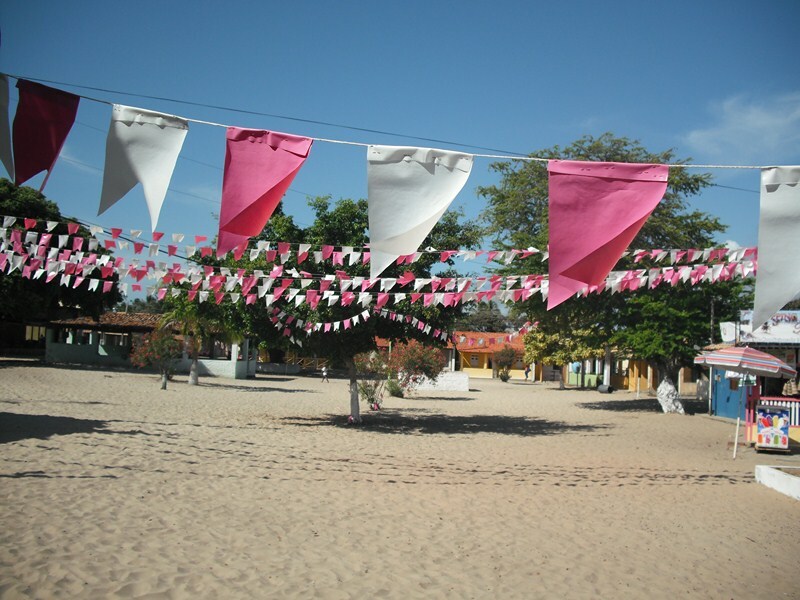 It’s widely-spread and passionately practiced all over Bahia. These beliefs and rituals were brought by African priests, who were transported to Brazil as slaves in 19th century. I will definitely write about it later in this blog. Gifts not for humans but for spirits. Quite similar to our funeral traditions here, in Russia. Despite all the interest to candomble, this aspect nor me, neither my Brazilian friends approve. As you already know, I prefer to use animals as photo models : ) And this I successfully had done in this trip too. 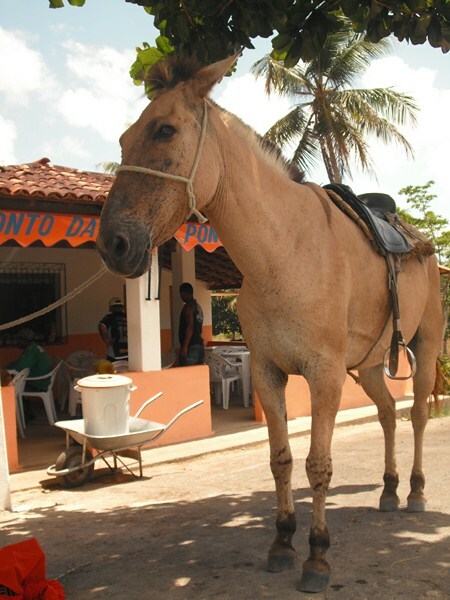 Horses are widely used all over rural Bahia. This horse we met near road restaurant. 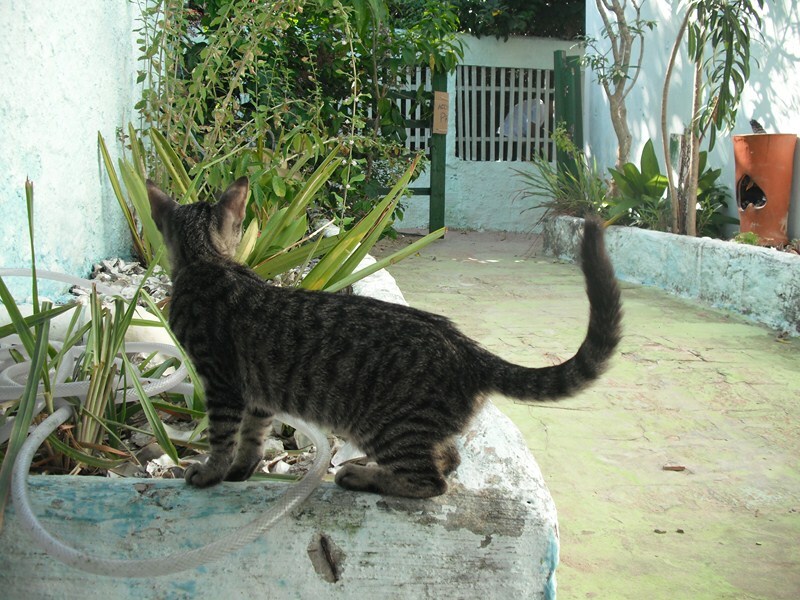 This gata linda (beautiful cat) lives in a hostel of the village Mangue Seco. Local birds are skillful hunters! They come to the tide in a group, waiting for the moment, when the ocean will bring little crabs siri to the shore. 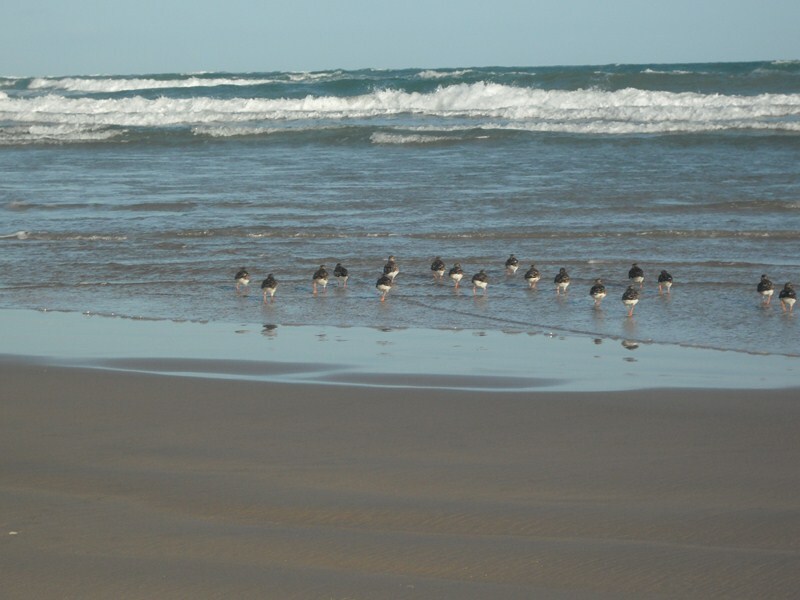 Then simultaneously they turn and pursue defenceless creatures the beach, where it's harder to find shelter. This bull watched me in the evening. 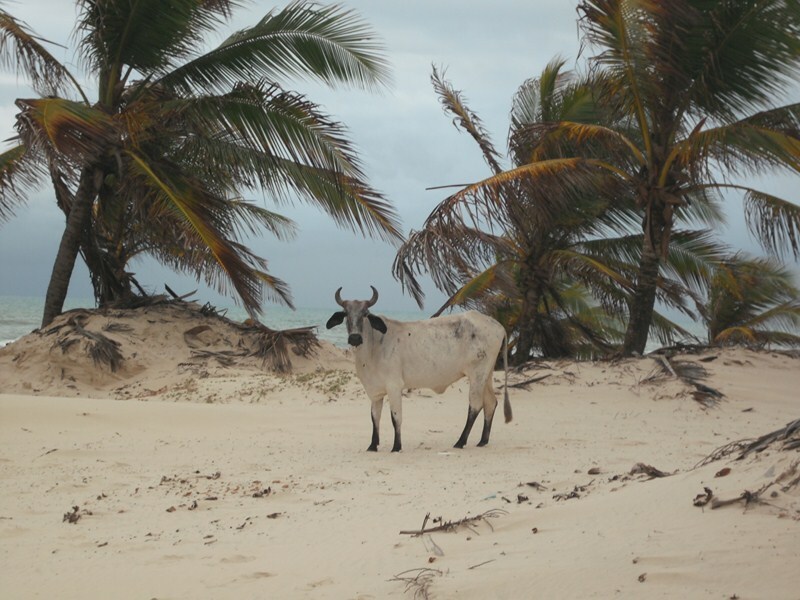 After tourists left the coast of Mangue Seco he and his family came to the beach. 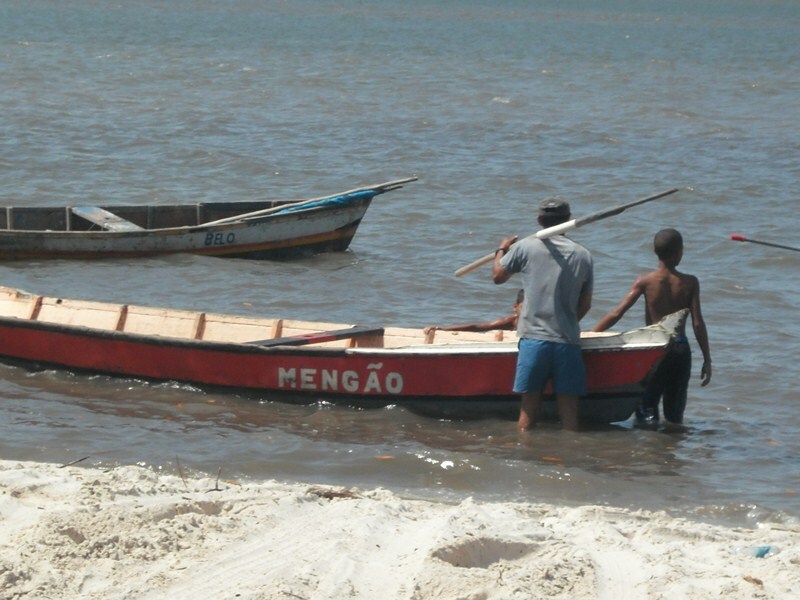 To get to Mangue Seco we needed to pass the river. In a small village was almost noone. A man on a peer, two boys playing in the water and a fisherman. 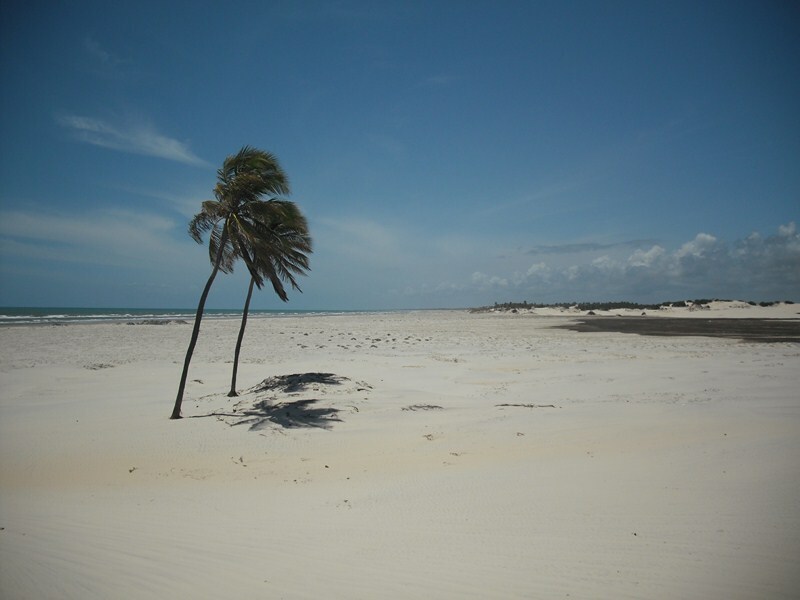 Mangue Seco hid behind the white sandy dune. There’s a pousada (hostel) right after the restaurant on the shore. Several boats hung on water during high tide, laying down on a sand during low tide. After 20-minutes-long ride we were finally on desirable shore. We took our a bit wet stuff out and started out lively walk to the ocean. 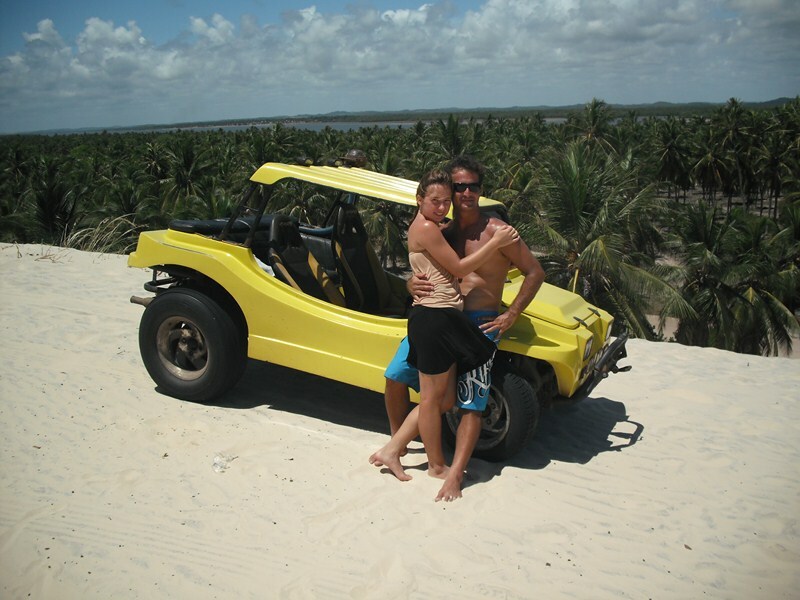 Some tourists prefer to hire a boogy – light car that is used to drive on dunes. But we decided that 10 minutes ride is not worth 25 reals. 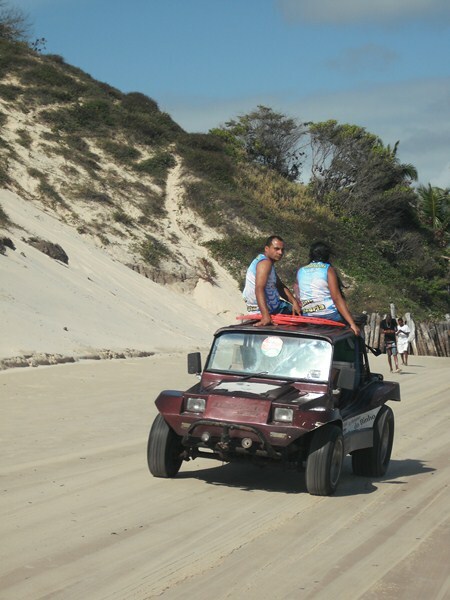 Boogy drivers feel all right to climb any dune in Mangue Seco. 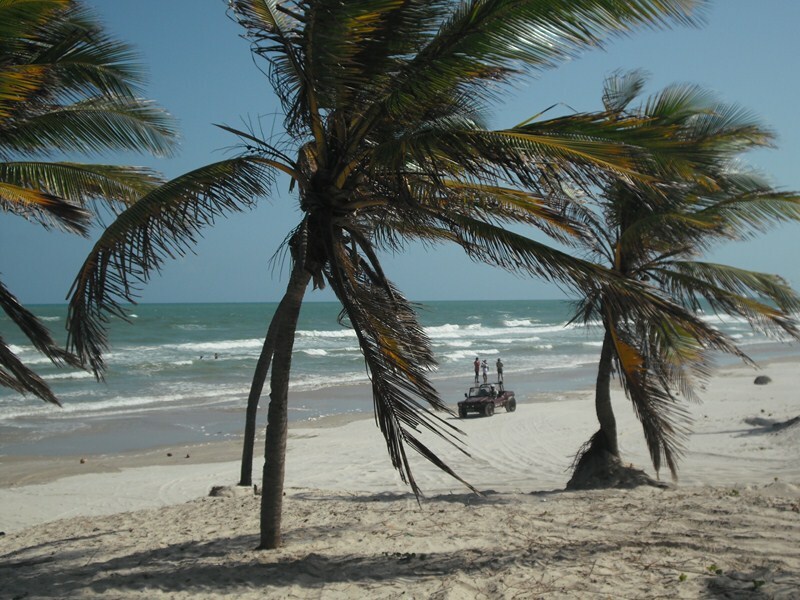 It was Saturday, and the beach of Mangue Seco was lively. People rolled in ocean waves, fierce and wonderful as any ocean wave is. Others relaxed in hammocks – such a lovely invention of humankind. 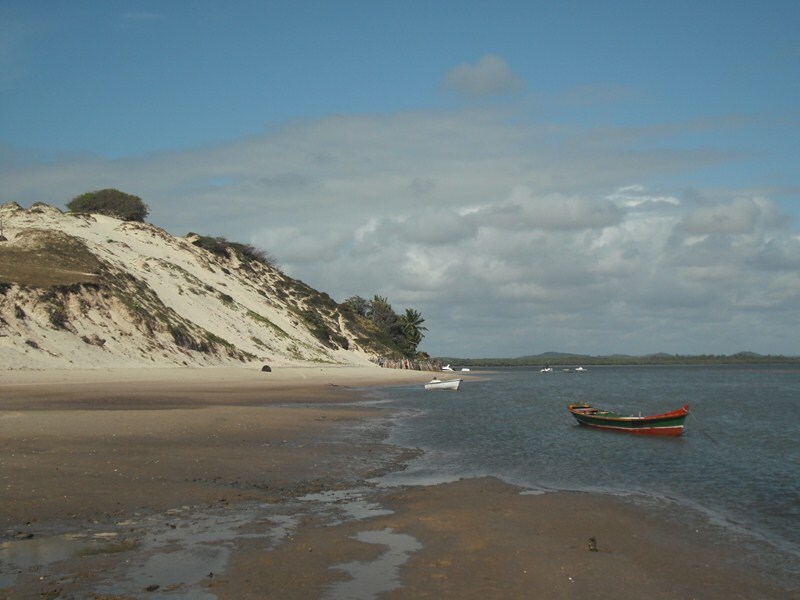 Cris remembered that 20 years ago there was a camping on the beach of Mangue Seco. 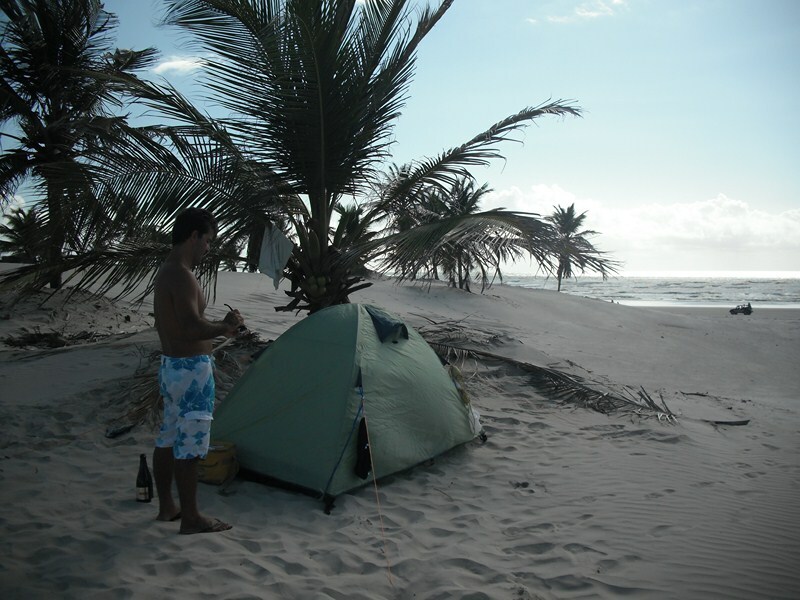 – There’s no camping anymore, – told us a woman, who lives in a house near the beach. – But you can camp right here, on the sand. This is what three couples did who stayed on New Year. In the house of the family that lives on the coast of Mangue Seco. And this is what we did : ) Another news – and this time good ones – were that till 18-00 the beach would be only for us. 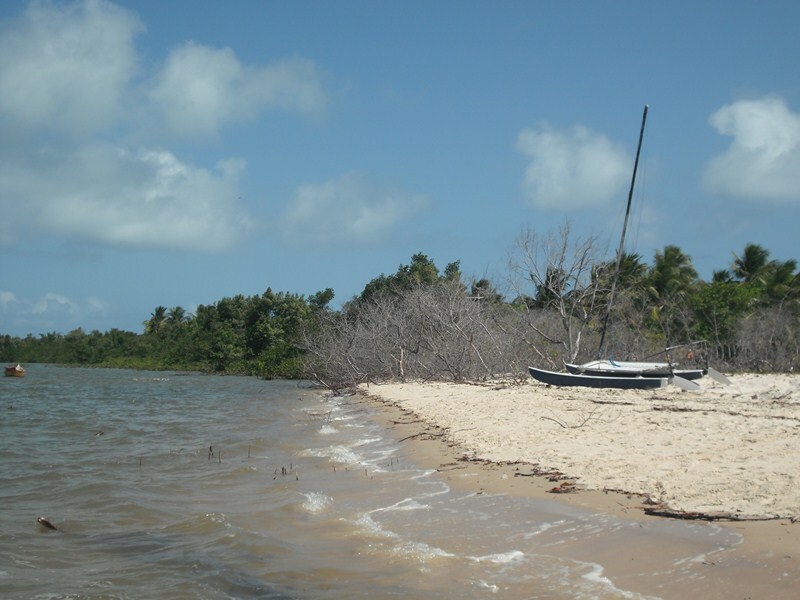 Everyone leaves the coast of Mangue Seco till evening. Except us. 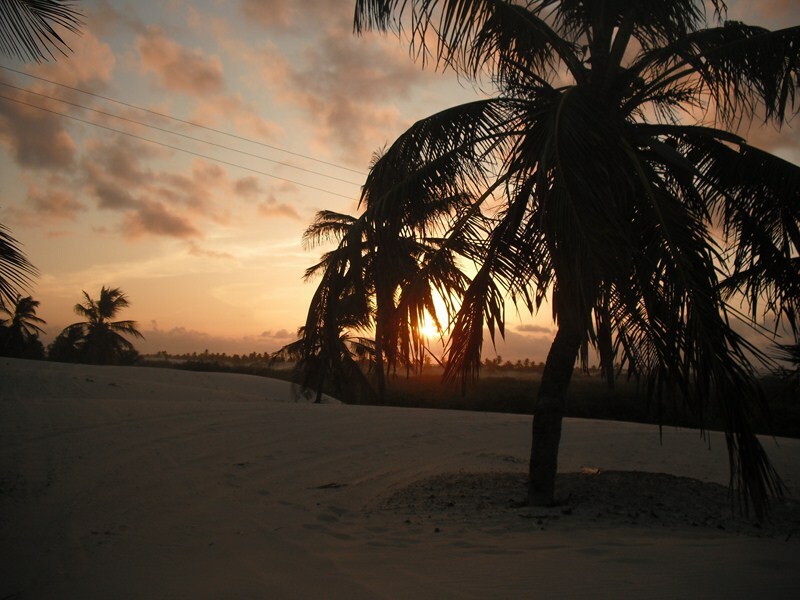 Real sunset of Mangue Seco. 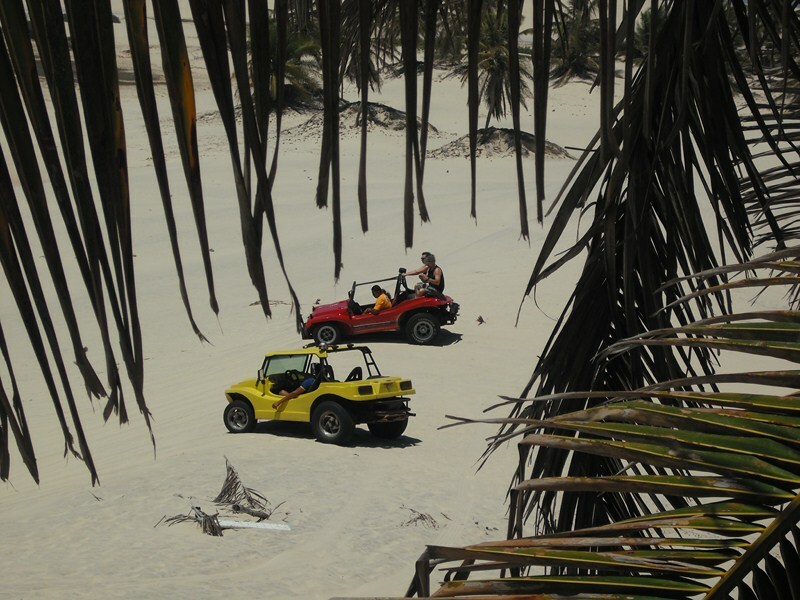 One of the main entertainments of Mangue Seco – boogy drive through picturesque white dunes. Staying on a beach, we heard excited cries of passengers, when boogy climbed up the dune or rushed down it. We didn’t even try to resist temptation – and hired a boogy by ourselves. The driver brought us to the point, where inicial shots of the novela were shot. Those dunes and palms are well- known by the whole generation of Brazilians. 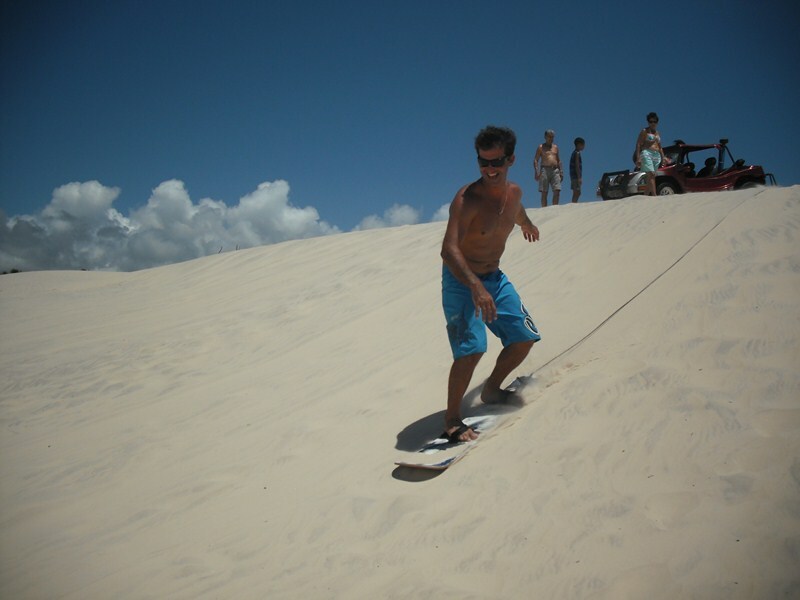 We decided to start preparations for “total desertification” now, and learned sandboarding. Sincerely – after snowboarding and surfing it’s slow and boring. Romantic spot of Mangue Seco - Romeo and Julietta. At the end of the second day of our stay rainy clouds started to gather on the sky. Wind got stronger, and sand rose around our tent. We couldn’t open the hatch not having in minutes a pile of sand inside. 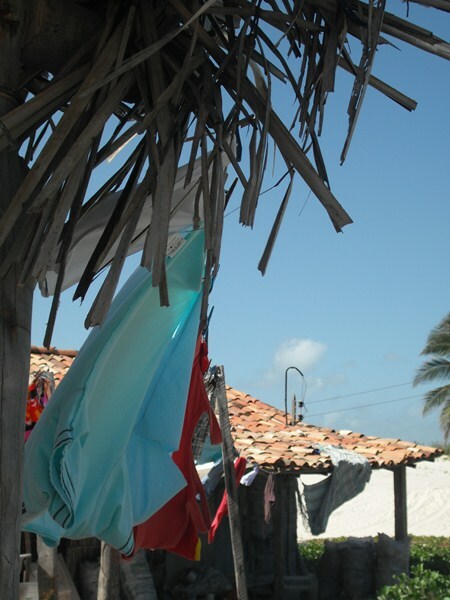 Ocean roared and came close to wooden tents on the shore. It was getting darker and darker, clouds veiled the sun that was still high. And we decided to leave. I still shake out of all my things sand of Mangue Seco.